Христос Воскрес! Воістину Воскрес! Christ Is Risen! He is Truly Risen! Конґрес Українців Канади вітає всю українську громаду із світлим празником Христового Воскресіння! The Ukrainian Canadian Congress wishes you a Blessed and Happy Easter! Кoнґрес Українців Канади висловлює найкращі побажання Ієрархам Українських Церков, Крайовим Проводам та членам Складових Організацій Конґресу, всій українсько-канадській громаді та всьому українському народові на Батьківщині та в Діаспорі! Зичимо Вам та Вашим родинам Божого благословення і щиро дякуємо за допомогу у праці Конґресу. The Ukrainian Canadian Congress expresses its best wishes to Ukrainian Churches, Branches and Member Organizations, the Ukrainian Canadian community and to all Ukrainians around the world. We wish you and your families God’s blessings and sincerely thank you for all your help in the work of the Congress. For all of us, Easter brings with it renewal and the promise of new opportunities and successes. As we celebrate the Resurrection of Our Lord Jesus Christ with our loved ones, we remember and honour those who have sacrificed so much for Ukraine’s freedom, and we pray that peace may soon return to Ukraine. It is a deep personal honour for me to serve our community. I am extraordinarily proud of the work we have done and all that we have accomplished together. The first months of 2015 have continued to be extraordinarily busy for the Ukrainian Canadian Congress, our provincial councils, branches, and member organizations. We have commemorated the first anniversary of the Revolution of Dignity, and the UCC continues to work tirelessly to support Ukraine as it bravely defends itself against Russia’s invasion. Our efforts have produced real results. Canada has taken a leadership role in the international community in supporting Ukraine. Canada has provided financial and non-lethal military assistance, as well as increased support for economic and democratic development that to Ukraine. Canada’s Minister of National Defence, the Hon. Jason Kenney, announced recently that Canada will provide Ukraine’s armed forces with satellite images to assist in defending Ukraine. Canadian volunteers in Ukraine continue to play an important role in ensuring that aid is distributed quickly and efficiently to those for whom it is intended. 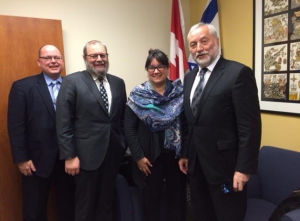 The UCC continues to work with all political parties as well as provincial and municipal governments to maximize support for the people of Ukraine. We have provided dozens of briefings, engaged Members of Parliament, the Prime Minister of Canada, the Rt. Hon. Stephen Harper, key Ministers, and Opposition leaders to ensure that Canada’s support for Ukraine is unwavering, united and impactful. It is thanks to the persistent efforts of our community that we have kept these issues at the forefront, and have been able to achieve positive outcomes. Together we have made a difference. As we enter the second year of a protracted crisis facing Ukraine, our community from coast to coast has responded with unity, resolve and persistence. We have shown what we can achieve when we work together! Our past successes motivate our community to roll up our sleeves to face new challenges and undertake new endeavours. 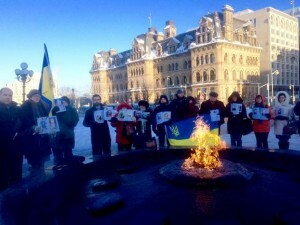 As we continue our work in support of Ukraine, we also continue to focus on issues of importance to the Ukrainian Canadian community here at home —education about the Holodomor, the continued recognition of Canada’s First World War Internment Operations, the Memorial to the Victims of Communism, Ukrainian-language schools, cultural programs and community development. On behalf of the UCC, and my family—Adrianna, Roman, Danylo, Larysa and Olena, please accept our sincere wishes for a wonderful Easter celebration! В час, коли ми святкуємо Воскресіння Ісуса Христа з нашими родинами та близькими, ми пам’ятаємо й вшановуємо тих, які загинули у боротьбі за свободу України, й тих, які сьогодні захищають незалежність нашої Батьківщини. Для мене є особливо велика честь служити нашій громаді. Я пишаюся нашою роботою, й тим, що ми разом досягнули. Успіхи Конґресу Українців Канади, провінційних рад, місцевих відділів та складових організацій не були б можливими без відданої роботи численних волонтерів та щедрої фінансової підтримки нашої громади, за що ми дуже вдячні. Від імені Конґресу Українців Канади, й моєї сім’ї – Адріани, Данила, Романа, Лариси та Олени, вітаємо Вас з Світлим Празником Христового Воскресіння та бажаємо Вам щастя, здоров’я та подальших успіхів! A delegation from the Ukrainian Canadian Congress accompanied Mr. Parubiy for his meetings in Ottawa. 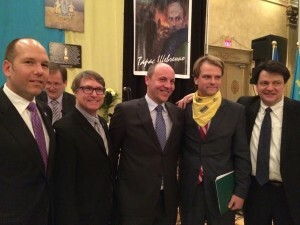 On Monday, February 23, 2015, Mr. Parubiy met with Canada’s Minister of Foreign Affairs, the Hon. Rob Nicholson, House of Commons Speaker the Hon. Andrew Scheer and several MPs. Mr. Parubiy attended a solemn commemoration for the Heavenly Hundred at the Centennial Flame. In addition to Mr. Parubiy’s official meetings, the Ukrainian Canadian Congress delegation met with the Honourable Ed Fast, M.P., P.C., Minister of International Trade, to discuss Canada-Ukraine bilateral economic relations; the Honourable Jason Kenney, M.P., P.C., Minister of National Defence, to discuss Canada’s leadership and support for Ukraine in the face of Russia’s invasion and continued aggression; and Prime Minister of Canada the Rt. Hon. Stephen Harper, M.P, P.C., and his office. 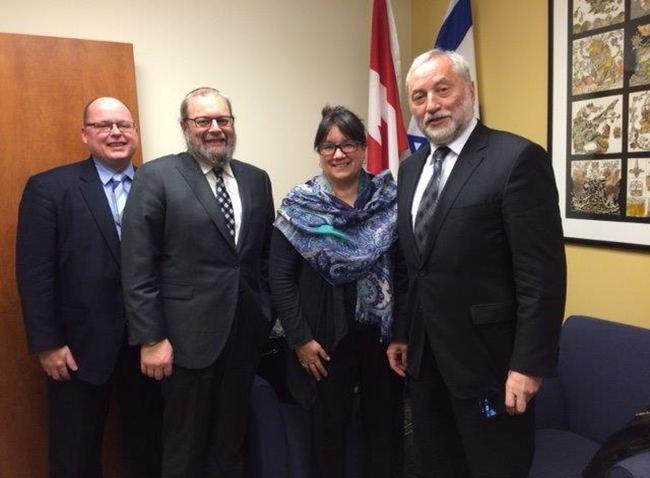 Members of the delegation also met with the Honourable Ralph Goodale, M.P. and Marc Garneau, M.P. from the Liberal Party on February 24, 2015. A meeting with Official Opposition Foreign Affairs Critic Paul Dewar, M.P., Peggy Nash, M.P. and Linda Duncan, M.P. took place on February 26, 2015. Перший Заступник Голови Верховної Ради України, Андрій Парубій, відвідав Канаду (21-24-го лютого). Запрошений спікером Палати Громад Канадського Парламенту Високоповажним Ендрю Шіром, пан Парубій прибув в Канаду в суботу, 21-го лютого, 2015. В неділю вечір, відбулася вечеря та збір коштів “В шану хоробрих захисників України” в ресторані Золотий Лев. 400 людей були присутні, й вечером провадив пан Маркіян Швець. Подія урочисто вшанувала пам’ять Героїв Небесної Сотні. Пан Парубій був головним доповідачем. 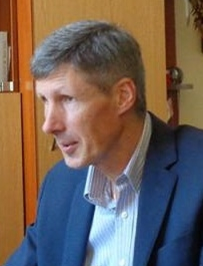 Високоповажний Кріс Александр, Міністр громадянства та імміграції, Павло Ґрод, Національний Президент Конґресу Українців Канади та Тарас Багрій, Президент Торонтонського відділу Конґресу Українців Канади також виступили з промовами..
Виступаючи перед присутними, пан Парубій висловив подяку Канаді та українсько-канадські громаді за їхню допомогу й підтримку підчас Майдану, й підчас російського вторгнення в Україну, яке продовжуєтся. Він закликав Канаду надати летальну та не-летальну допомогу Збройним Силам України. Пан Парубій зазначив різницю між сьогоднішною ситуацією в Україні, та ситуацією, в якій Україна знаходилася в минулому столітті. “Сьогодні, Україна має єдиний уряд, з’єднане суспільство, сучасну армію, та підтримку міжнародної спільноти,” сказав пан Парубій. Пан Ігор Козак став одним з 50-ти канадців які офіційно отримали Канадські прапори від Прем’єр Міністра Стівена Гарпера з нагоди відзначення 50-ої річниці Канадського прапора. Пану Козаку представили прапор на знак визнання, що він був першим іммігрантом з бувшого СCCР який вчився в престижному Королівському Військовому Коледжі Канади. Пан Козак служив Канаді як офіцер Збройних Сил, як в Канаді так й за кордоном, й два рази був нагороджений за видатне провідництво. Після виходу у відставку від Збройних Сил, він отримав ступінь Магістра бізнесової адміністрації й став успішним підприємцем. Він також знаходить час підтримувати благодійні справи, та займає провідничу роль в українсько-канадські громаді. Пан Козак служить в якості радника Ліґи Українців Канади, та є волонтером Конґресу Українців Канади та Світового Конґресу Українців. The UCC is extremely proud of Mr. Kozak and this achievement is a reflection of the contributions and influence that our community has provided to Canada. 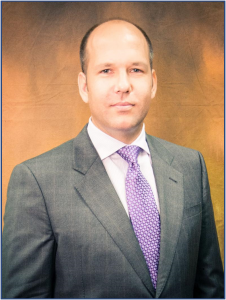 We thank Mr. Kozak once more for his tireless dedication and hard work to our community and causes. He has inspired us to continue our work, from our local chapters to the provincial and national levels, for he is an example of what can be achieved with resilience and determination in upholding out heritage and identity in this vast multicultural country.This award comes in light of our flag’s 50th anniversary and Mr. Kozak is one of 50 individuals and organizations that have significantly contributed to our country. 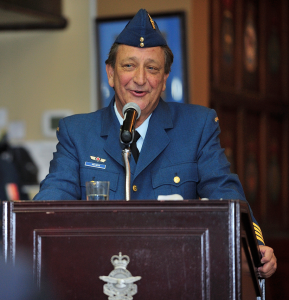 Mr. Eugene Melnyk became the new honorary colonel of 414 Electronic Warfare Support Squadron during a ceremony in Ottawa on January 14, 2015. 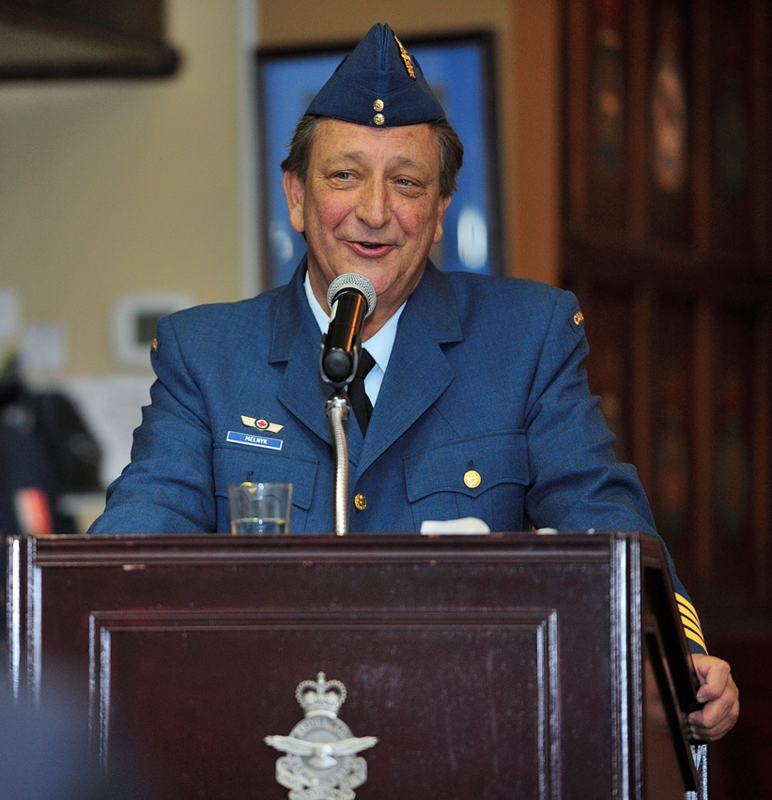 As the owner of the Ottawa Senators, Honorary Colonel Melnyk is a prominent member of the community, and he devotes himself to several charitable ventures in Ontario, Barbados, and his ancestral homeland of Ukraine. Colonel Melnyk is a member of the Ukrainian Canadian Congress Advisory Council. The UCC congratulates Mr. Melnyk on this most prestigious award. 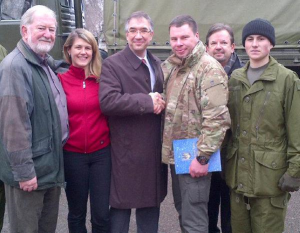 The Ukrainian Canadian Congress requested that Canadian volunteers participate in the delivery of Canadian military gear provided as part of an aid package announced by the Government of Canada to Ukraine to ensure that these desperately-needed military grade, winter uniforms, boots and other assistance reached Ukrainian soldiers on the front lines. The volunteers served under the stewardship of Canada’s Ambassador to Ukraine, His Excellency Roman Waschuk and Ms. Lenna Koszarny, Chair of the UCC Ukraine Advisory Council led the Canadian volunteers, long-term, active members of the Ukrainian business community. The UCC thanks and recognizes Roman Sawycky and Bryan Disher for their contribution. The Canadians worked in tandem with Ukrainian volunteers led by Bohdan Kovalev, a member of the Volunteer Council appointed by Ukrainian President Poroshenko and overseen by Yuriy Biryukov and David Arakhamia, who assisting the Ukrainian government to reform the Ministry of Defence. Конґрес Українців Канади вітає Сергія Касянчука, з Торонто, Канада з призначенням на посаду Директора Світового Конґресу Українців в Українців. Це призначення стало завершенням широкого відкритого конкурсу, який включав розгляд більше 70 кандидатів з 12 країн світу. Це призначення стало завершенням широкого відкритого конкурсу, який включав розгляд більше 70 кандидатів з 12 країн світу. Сергій Касянчук, який народився і виріс у Львові, закінчив Львівський Державний Університет за спеціальністю економічна кібернетика та здобув ступінь маґістра з політичних наукв Українському Вільному Університеті в Мюнхені. У Канаді він працював у сфері фінансів аналітик у Canadian Imperial Bank of Commerce та Кредитовій Спілці Будучність. Як волонтер, Сергій Касянчук має великий досвід праці в українських організаціях на світовому та місцевому рівнях, включно з Радою директорів СКУ, Радою директорів та Екзекутивним комітетом Конґресу Українців Канади (КУК),Ліґою Українців Канади, Суспільною Службою Українців Канади, Канадсько-українською Імміграційною Службою та відділом Конґресу Українців Канади у Торонто. У 2012 році Сергій Касянчук був рукоположений у чин диякона Української Греко-Католицької Церкви. “Я знаю Сергія багато років. Він віддана, професійна людина, й я переконаний, що в цій відповідальній позиції, він успішно працюватиме на користь як України, так і світової української громади. Мені приємно, що ми далі разом будемо тісно співпрацювати,” сказав Тарас Залуський, Виконавчий Директор Конґресу Українців Канади. 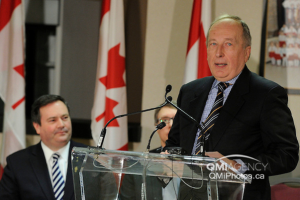 The Ukrainian Canadian Community is grateful to the Government of Canada, the Ministry of Multiculturalism, and Minister Jason Kenney, for supporting the “Holodomor National Awareness Tour”. The three year grant, valued at $1.5M, will support the education of tens of thousands of students, community leaders and the public at large on the historical events of the horrific Holodomor Genocide in Ukraine, 1932-33. 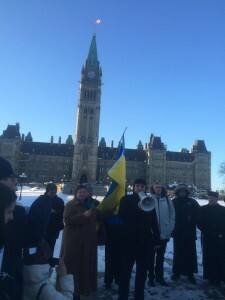 The “Holodomor National Awareness Tour”, is a joint project between four organizations: the Canada Ukraine Foundation (CUF, the lead on the project), the Ukrainian Canadian Congress (UCC), The Ukrainian Research and Educational Canadian Research and Documentation Centre (UCRDC) and the Holodomor Research and Education Consortium (HREC). The tour takes place on a customized 42′ RV, with a state-of-the-art interactive audio-visual technology centre on board. The RV will be wheelchair accessible and will tour Canada, visiting elementary and secondary schools, universities, government buildings, Ukrainian community and Canadian mainstream events, and festivals and gatherings across the country. The goal of the awareness tour is to educate all Canadians about the artificial famine created by Joseph Stalin in 1932-33, murdering millions of Ukrainians and Eastern Europeans. This project will operate as a teaching module for elementary and high school students, teaching the values of multiculturalism, diversity and the importance of human rights and freedoms, the rule of law and respect for human dignity. It will also present the concept of crimes against humanity and genocide as seen through the lens of the Holodomor. 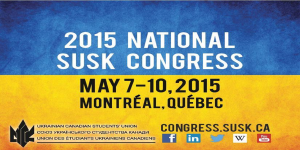 The Ukrainian Canadian Students’ Union (SUSK) is hosting the 2015 National SUSK Congress from May 7th to 10th, 2015 in Montréal, Quebec. The Congress aims to encourage and challenge leaders of the Ukrainian Canadian student community to come together, to discuss and deliberate relevant questions and issues, and to spearhead the future of youth leadership and involvement in Canada and Ukraine. All Congress information, including program and registration details, can be found at www.congress.susk.ca. 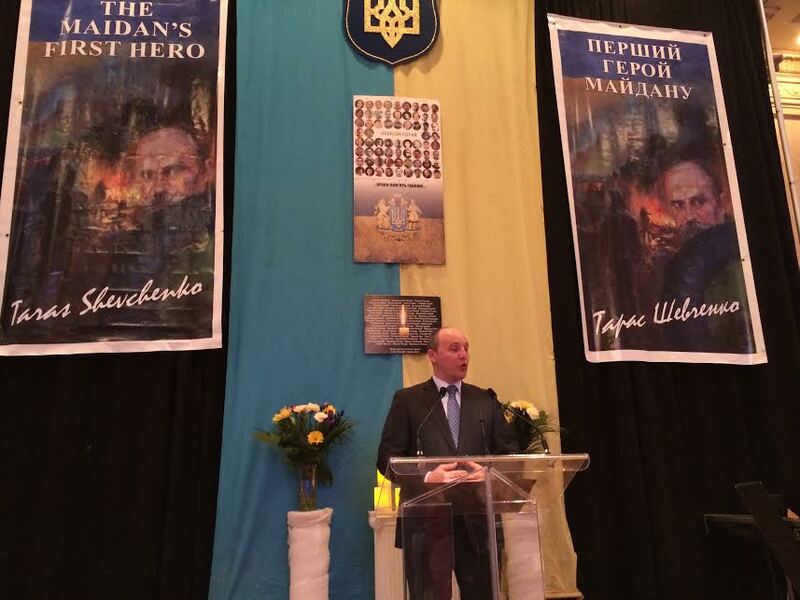 The Ukrainian community has — as much as any community in Canada — suffered at the hands of communist regimes in Ukraine, for over 70 years in Eastern Ukraine and over 45 years in Western Ukraine respectively. 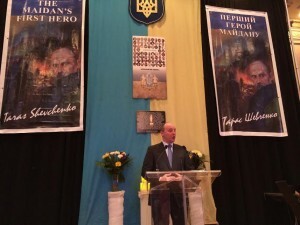 Ukrainians suffered through the Holodomor, Stalin’s genocidal famine of 1932-33 – which killed millions; through Stalin’s Great Terror; through forced labour and concentration camps in the Gulag, repression of language, religion, culture and National identity all meant to destroy the very idea of a Ukrainian nation. A Memorial to the Victims of Communism is being built in Ottawa. We believe it should receive pride of place in the core of the Nation’s capital, as so many of those who have built the Canada we cherish and enjoy fled the evils of communism and built this country. Future generations deserve to learn the lessons of this history – our history. The Leadership Award of the Ukrainian Canadian Congress provides the opportunity to recognize worthy individuals in the communities where they reside. The award was established in August 2010.
b) a Ukrainian Canadian that has demonstrated individual excellence on a national scale in the areas of arts, culture, athletics, media, politics, business, entertainment, education, academia, health sciences, community or religious development, social services, civil society and leadership. Nominations forms are available on the UCC website. The deadline for submitting nominations is April 30, 2015. The UCC Board of Directors approved a motion designating October 28 as the date of commemoration of Canada’s First World War Internment Operations. Again this year, the Ukrainian Canadian Congress continues its annual initiative – the Pysanka Fundraising Campaign. 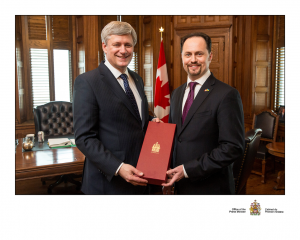 The agenda for the Ukrainian Canadian community set for the next three years at the Triennial Congress of Ukrainian Canadians is ambitious – focusing on areas such as immigration, mobilizing youth, language, education, and Canada-Ukraine relations. In order to accomplish our goals we need your financial assistance – please donate generously to support the work of the Congress.